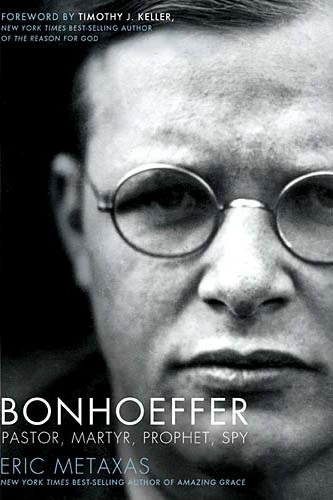 My current reading project for the spring is Eric Metaxas’ biography of Dietreich Bonhoeffer. Eric came and spoke at our church a few weeks ago. He’s a great speaker (very funny), and a talented writer, too. I’ve benefited a lot from the book already (I’m not quite half-way done), and I can tell its only going to get more interesting as the struggle in the German church in the 1930’s continues to heat up. My primary interest is in Bonhoeffer’s theology. I find it fascinating to encounter theologians who are outside my own tradition of American evangelicalism because they are often exploring questions that I have not considered before. In the past this has been part of my interest with Barth, and Bonhoeffer makes for an interesting comparison with Barth, because of their friendship, and because of Barth’s influence on Bonhoeffer (which in my opinion is quite significant), and because they share some similar theological emphases. They also make for an interesting comparison because of some of their personal and vocational and theological differences, and because of how vastly differently they have been viewed by English-speaking evangelicals. I think it would be interesting to do a study project comparing their different receptions among English-speaking evangelicals and analyzing the underlying reasons. My impression thus far from the book is that Bonhoeffer was, above all, an ecclesiologist. The question posed in his doctoral dissertation at the University of Berlin seems to me to be the question of his life, namely, what is the church? Out of his struggle with that question comes all that he did, from his wonderful efforts to make theology intelligible to children to his courageous opposition to Hitler and anti-semitism. His vision of the church as a sanctified community was simply incompatible with non-action during the events in Germany in the 1930’s. First of all I will confess quite simply – I believe that the Bible alone is the answer to all our questions, and that we need only to ask repeatedly and a little humbly, in order to receive this answer. One cannot simply read the Bible, like other books. One must be prepared really to enquire of it. Only thus will it reveal itself. Only if we expect from it the ultimate answer, shall we receive it. That is because in the Bible God speaks to us. And one cannot simply think about God in one’s own strength, one has to enquire of him. Only if we seek him, will he answer us. Of course it is also possible to read the Bible like any other book, that is to say from the point of view of textual criticism, etc. ; there is nothing to be said against that. Only that that is not the method which will reveal to us the heart of the Bible, but only the surface, just as we do not grasp the words of someone we love by taking them to bits, but by simply receiving them, so that for days they go on lingering in our minds, simply because they are the words of a person we love; and just as these words reveal more and more of the person who said them as we go on, like Mary, “pondering them in our heart,” so it will be with the words of the Bible. Only if we will venture to enter into the words of the Bible, as though in them this God were speaking to us who loves us and does not will to leave us alon[e] with our questions, only so shall we learn to rejoice in the Bible . . . . If it is I who determine where God is to be found, then I shall always find a God who corresponds to me in some way, who is obliging, who is connected with my own nature. But if God determines where he is to be found, then it will be in a place which is not at all congenial to me. This place is the Cross of Christ. And whoever would find him must go to the foot of the Cross, as the Sermon on the Mount commands. This is not according to our nature at all, it is entirely contrary to it. But this is the message of the Bible, not only in the New but also in the Old Testament . . . .
And I would like to tell you now quite personally: since I have learnt to read the Bible in this way – and this has not been for so very long – it becomes every day more wonderful to me. I read it in the morning and the evening, often during the day as well, and every day I consider a text which I have chosen for the whole week, and try to sink deeply into it, so as really to hear what it is saying. I know that without this I could not live properly any longer (136-7).